The first generation of SCADA system relies with mainframe computers. As time goes by, the evolutionary of SCADA build on top of open system foundation (Unix) in 80’s. Perhaps the Microsoft product dominate the computer world. And such away engaged the transformation in 90’s. The SCADA software that utilizes the power of SQL databases provides flexibility and advantages to traditional SCADA system. One big benefit of using SQL databases with a SCADA system is that it makes it easier to integrate into existing MES and ERP systems, allowing data to flow seamlessly through an entire organization. (MES) – Manufacturing execution systems are computerized systems used in manufacturing, to track and document the transformation of raw materials to finished goods. (ERP) – Enterprise resource planning is the integrated management of core business processes, often in real-time and mediated by software and technology. Hadoop is essentially a distributed data infrastructure: It distributes massive data collections across multiple nodes within a cluster of commodity servers. Spark can interface with other file system including Hadoop Distributed File System (HDFS). Remark: From technical point of view, Spark is a data-processing tool that operates on those distributed data collections; it doesn’t do distributed storage. As of today, more and more business migrated their system application to Cloud platform including SCADA industry. Since SCADA system belongs to energy, food and beverage, manufacturing, oil and gas, Power, Recycling, Transportation, water and waste water. And therefore cyber security news and articles lack of their news. Perhaps we can hear the news is that after nuclear power station encounter hacker or malware attack. Actually SCADA now expand their user function to mobile device. 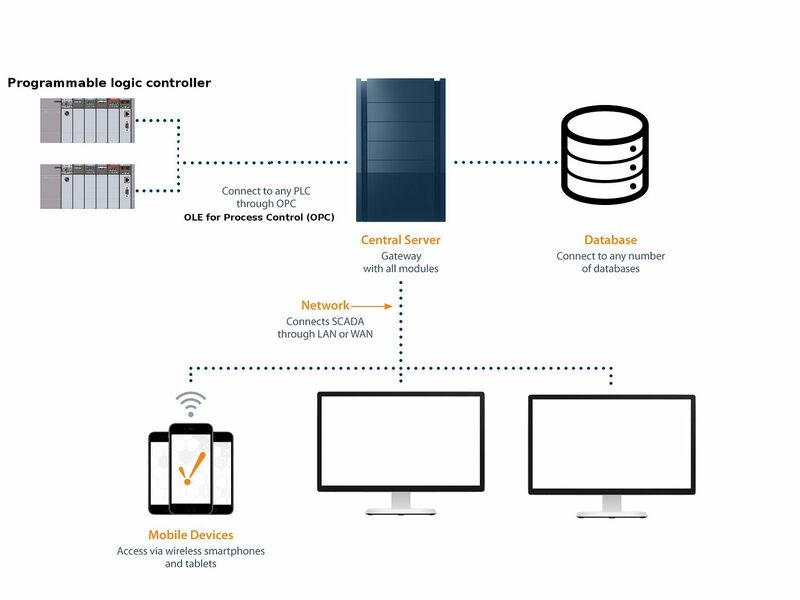 Even though a mobile phone can do a remote monitoring of the system. 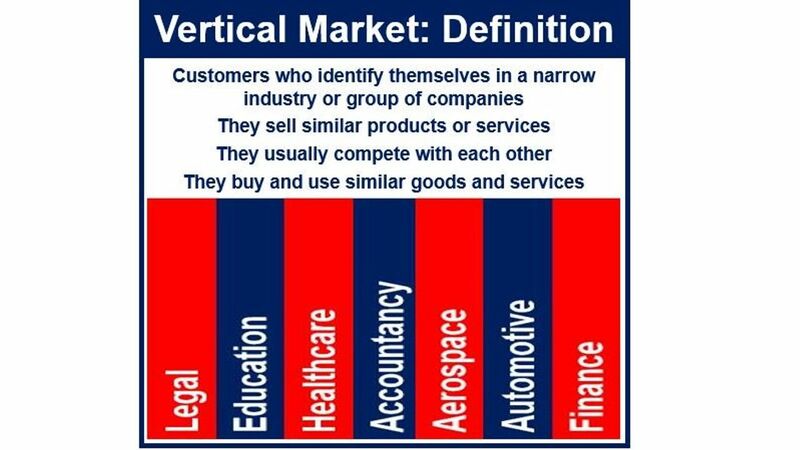 With WebAccess, users can build an information management platform and improve the effectiveness of vertical markets (see below picture for reference) development and management. 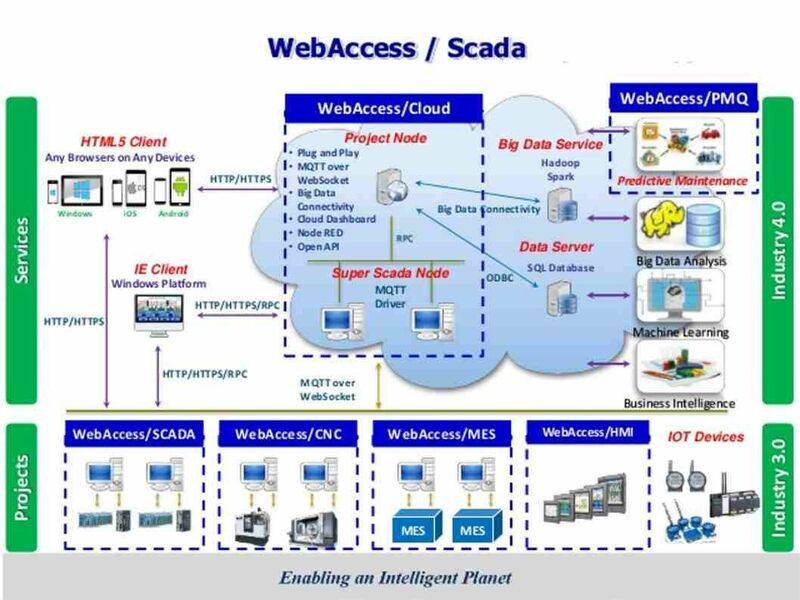 Let’s think it over, the WebAccess SCADA system involved in energy, aerospace and public facilities control. However those product sound like your IT devices. 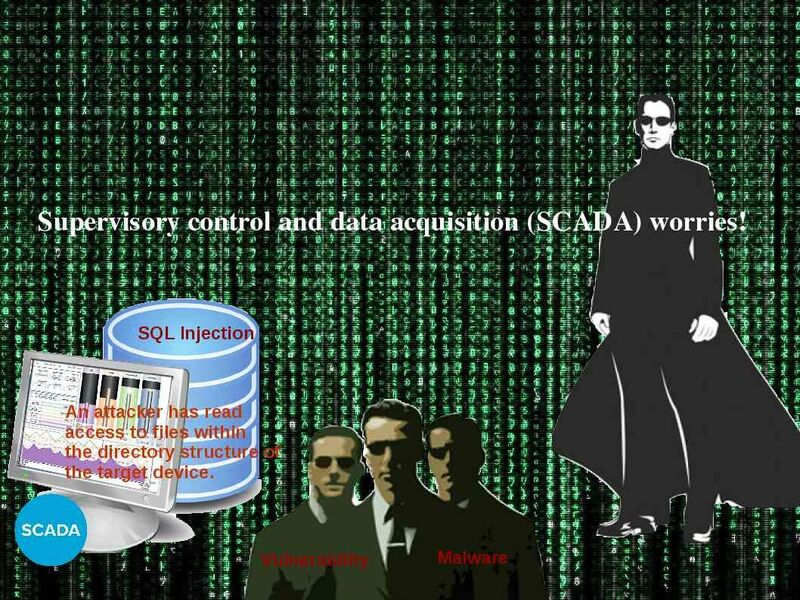 The SCADA hits vulnerabilities and recorded in CVE database not the 1st time. We know that hundreds of United flights were delayed after the airline experienced a server malfunction on Jul 2015. Lets reader judge by yourself, let review their vulnerabilities found so far. Does it relate to SCADA vulnerability occurs which causes denied of services. Or it is really server malfunction? Quote: Hundreds of United flights were delayed after the airline experienced a server malfunction on Jul 2015. Quote: A United spokeswoman said that the glitch was caused by an internal technology issue and not an outside threat or hacker. Advantech, a leader within the IPC global market. Advantech offers a comprehensive IPC product range that delivers reliability and stability for extreme environments, providing its customers with a one-stop shopping experience implementing Industry 4.0 and fulfilling their Industrial IoT needs. 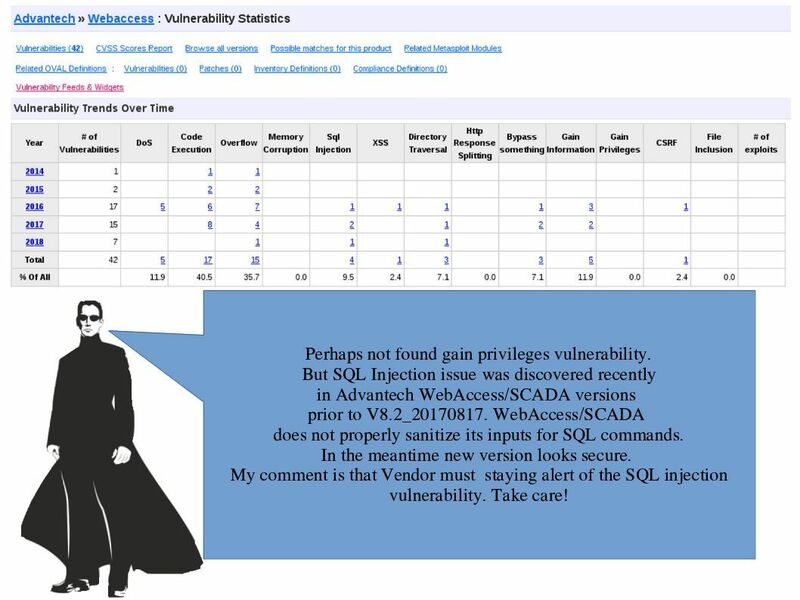 Let’s take a closer look on Advantech scada webaccess products vulnerabilities so far. 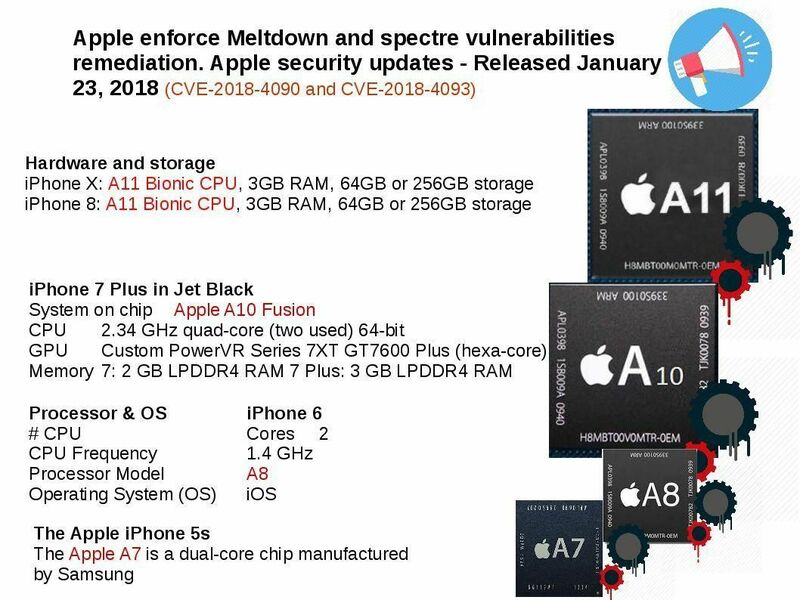 The vulnerabilities found on 2014 include an OS command injection, CVE-2014-8387, in the Advantech EKI-6340 series, a stack-based buffer overflow, CVE-2014-8388, in Advantech WebAccess, and a buffer overflow, CVE-2014-8386, in Advantech AdamView, CVE-2014-0770 – Advantech WebAccess SCADA webvact.ocx UserName Buffer Overflow. It looks that the design weakness keeps appear till today! For more details, please refer below details for references. Our observation in regards to above known vulnerabilities. Regarding to WebAccess support specifications. It support the following open real-time data connectivity : OPC, Modbus, BACnet, DDE Server and the following open offline data connectivity: SQL Server, Oracle, MySQL, and Microsoft Access Database. If the repository is the MS SQL server. The IT administrator must staying alert of the SQL injection vulnerability. Since the OS user privilege escalation via Windows Access Token abuse is possible also via SQL injection. IPv6 design limitation highlights by Cisco on 2013 RSA conference. 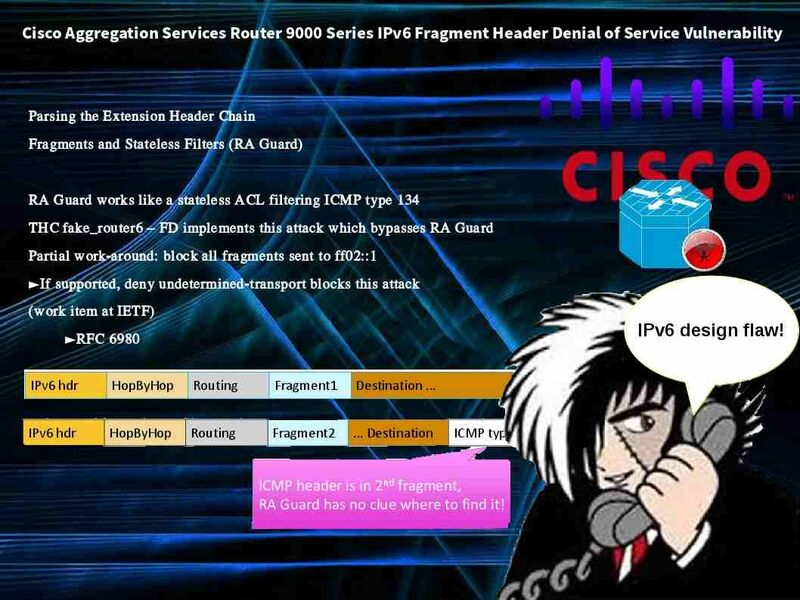 Since ICMP header is in 2nd fragment. Defense mechanism especially RA guard no cue where to find (see my cartoon picture). Perhaps stateful firewall can doing the defense. Meanwhile, this issue told the world there is no real secure Internet Protocol! 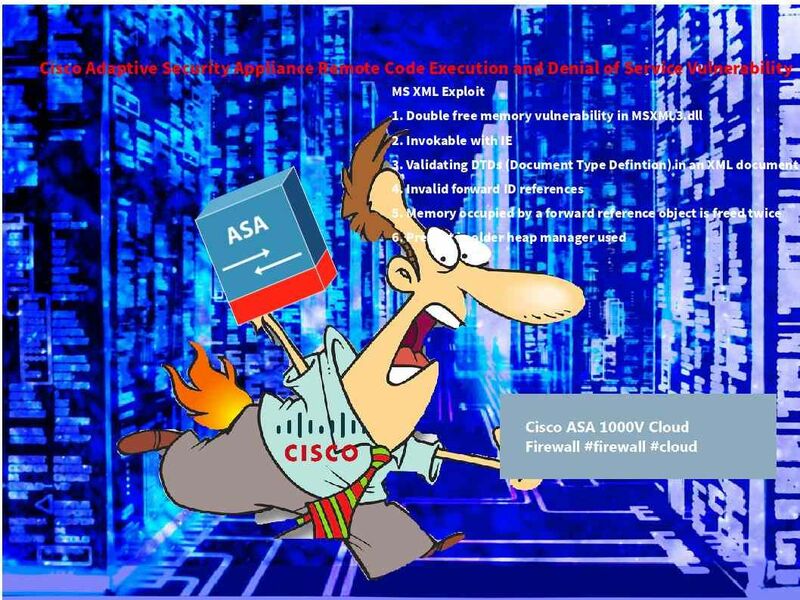 But this vulnerability occurs on Cisco only causes Denial of Service (reboot). At least no privileges escalation or data leakage. As we know the most common cryptocurrencies are Bitcoin, Ethereum,Ethereum Classic, Monero, Litecoin, OmiseGO, Ripple & Zcash. Fundamentally NEM Smart Asset System more secure than bitcoin. The NEM Blockchain utilizes a Proof-of-Importance calculation (rather than Bitcoin’s Proof-of-Work or PIVX’s Proof-of-Stake) to accomplish accord through a procedure that boosts dynamic support in the system. NEM is a peer-to-peercryptocurrency and blockchain platform launched on March 31, 2015. But the value of each coin is underestimation. 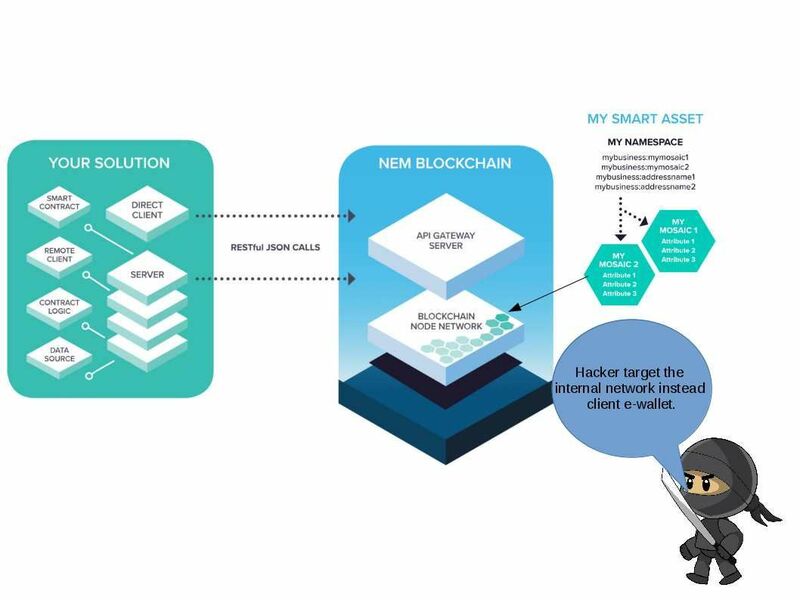 Why hacker target to NEM. Do you think hacker willing to engage hacking in difficult way ? Information update on 29th Jan 2018 – CNN claimed that this cryptocurrency heist is the biggest amount. Such huge value of financial lost wasn’t happened before! See below url for reference. Japan-based company said hackers broke in at 02:57am local time on Friday (12:57pm EST on Thursday, 25 January). The most recent cryptocurrency heist happened on February 2014. The victim firm is Mt. Gox. A bitcoin exchange in Japan. The heist value amount less than ¥48 billion. Coincheck started in August 2014 and is operated by Coincheck, inc. Similar of incident did not happen in past. Coincheck provides Two-Factor Authentication and Cold Storage. Remark: Cold storage in the context of Bitcoin refers to keeping a reserve of Bitcoins offline. Methods of cold storage include keeping bitcoins: On a USB drive or other storage media. On a Paper wallet. Coincheck follow JBA’s guidelines to ensure customers can have use coincheck’s services in secure (For more details, please see below url for reference). Secure Random Number Genaration – Customer don’t need to worry about vulnerability because coincheck’s wallet use RFC6979, a secure way for generating random numbers. Remark: RFC 6979 makes ECDSA DPA vulnerable at 2 levels. Yusuke Otsuka, Chief Operating Officer of Coincheck, said the stolen funds were kept in an online ‘hot wallet’ as opposed to a much more secure offline ‘cold wallet.’ However the officical spokeman says that bitcoins are to be stored offline when they are not being traded. Meanwhile CEO Koichiro Wada said its bitcoins were indeed stored offline but that the more than 5 million NEM coins that were stolen were not. According to the NEM (XEM) platform architecture (refer to above diagram) and the statement provides by the CEO (see below). A hints bring my attention to their company internal network. See whether is there insider threat happen in their office? It looks that implant malicious code then infiltrate malware to the distributed ledge system not easy to success. Since two factor authentication has been implemented. And therefore each transaction will be acknowledged on both parties (bitcoin exchange and end user). May be you can say hacker can counterfeit the SMS message by SS7 flaw. However such huge amount of transaction will be waken support staff. So I believe that the cyber incident happen this time may have following possibilities. Phishing email embedded web site cross site scripting and CSRF token is a popular way to stolen the user credential. Admin console or workstation encountered malware infection. A Zero day encountered on their open source application. Above assumption is my speculation on hearsay evidence and headline news. Let’ me keep my eye open and provide the status update to you guys afterwards. Information update on 29th Jan 2018 – CNN claimed that this cryptocurrency heist is the biggest amount. Such huge value of financial lost wasn’t happened before! See below url for reference. As we know the most common cryptocurrencies are Bitcoin, Ethereum,Ethereum Classic, Monero, Litecoin, OmiseGO, Ripple & Zcash. Fundamentally NEM Smart Asset System more secure than bitcoin. The NEM Blockchain utilizes a Proof-of-Importance calculation (rather than Bitcoin’s Proof-of-Work or PIVX’s Proof-of-Stake) to accomplish accord through a procedure that boosts dynamic support in the system. 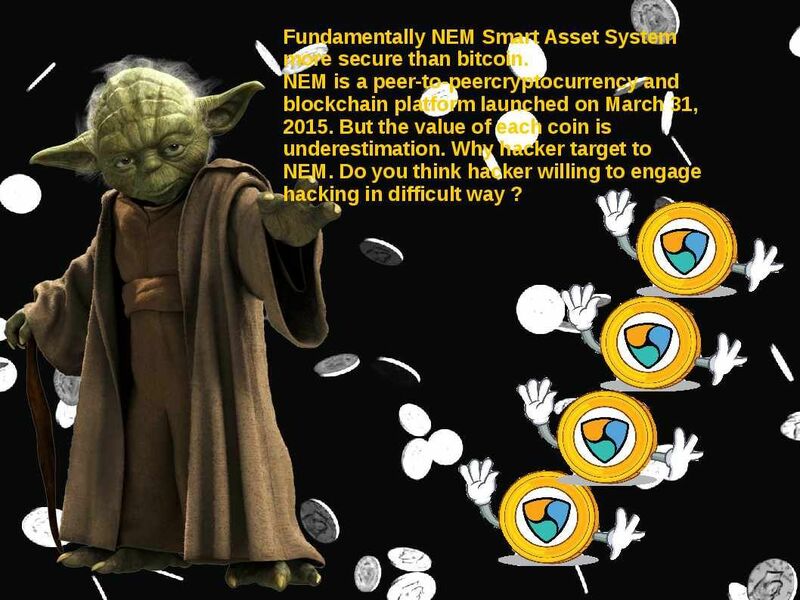 NEM is a peer-to-peercryptocurrency and blockchain platform launched on March 31, 2015. But the value of each coin is underestimation. 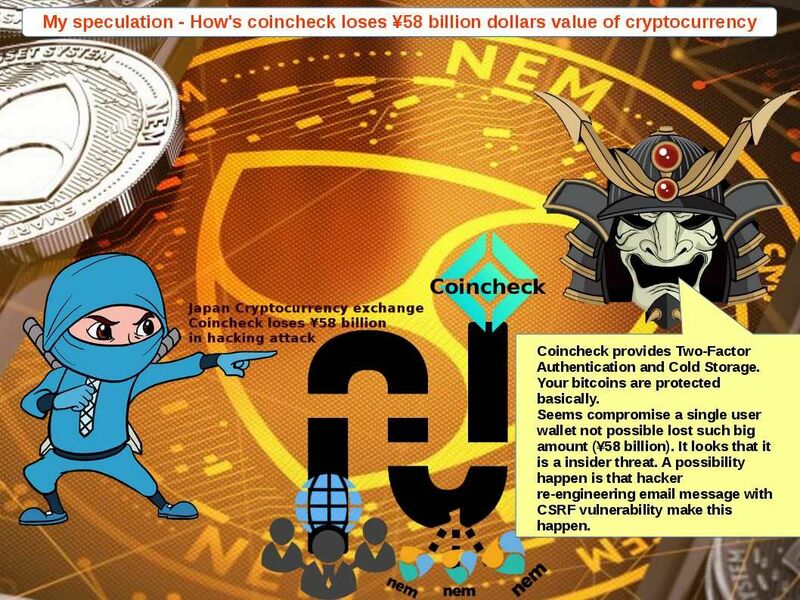 Why hacker target to NEM. Do you think hacker willing to engage hacking in difficult way ? During my penetration test engagement in past. I was surprised that no matter airline , financial and retail industries web online application solutions are deployed open source single-sign on resources. An incident occurred in Equifax which awaken the business world that open source application has potential inherent risk. It will jeopardize your firm reputation. 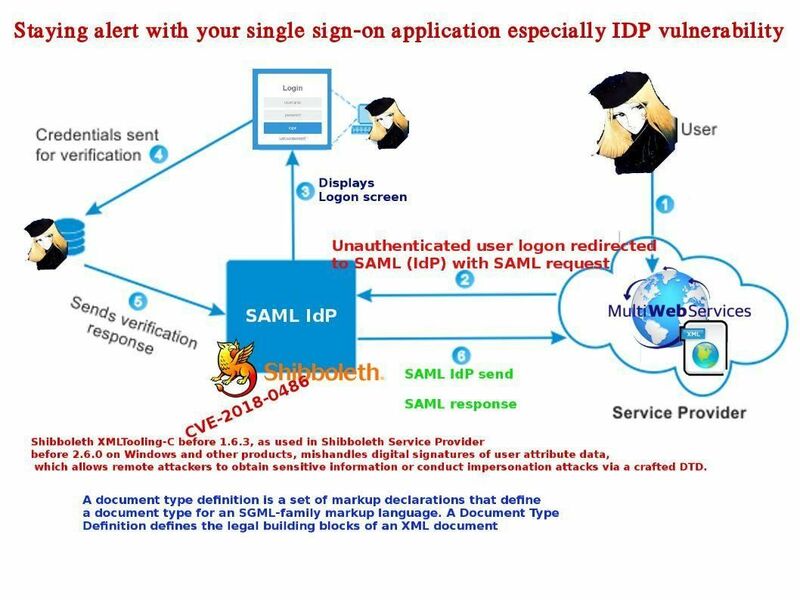 It looks that a very popular SAML IdP open source has vulnerability occurs. What is your comment? Remark: You can also find the details on attached picture diagram. • Separate control over instruction and data caches. • Restrictions on region size and alignment. As a result, the 3rd party unmanaged apps especially game might have problem occurs! 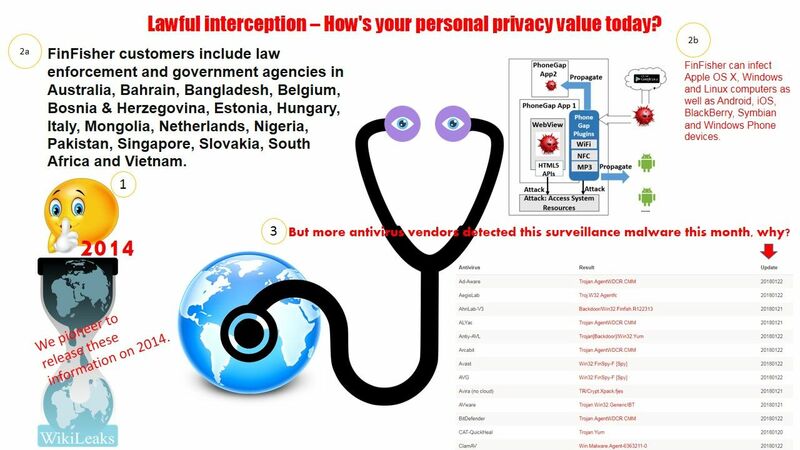 Lawful interception – How’s your personal privacy value today? Cloud computer platform looks like a fight carrier in the data world. Meanwhile, the data stored inside the cloud are under cloud protection. However different country implement different data protection law and data custodian policy. Perhaps development countries unaware this topics last decade. However big data upgrade his political position progressively. 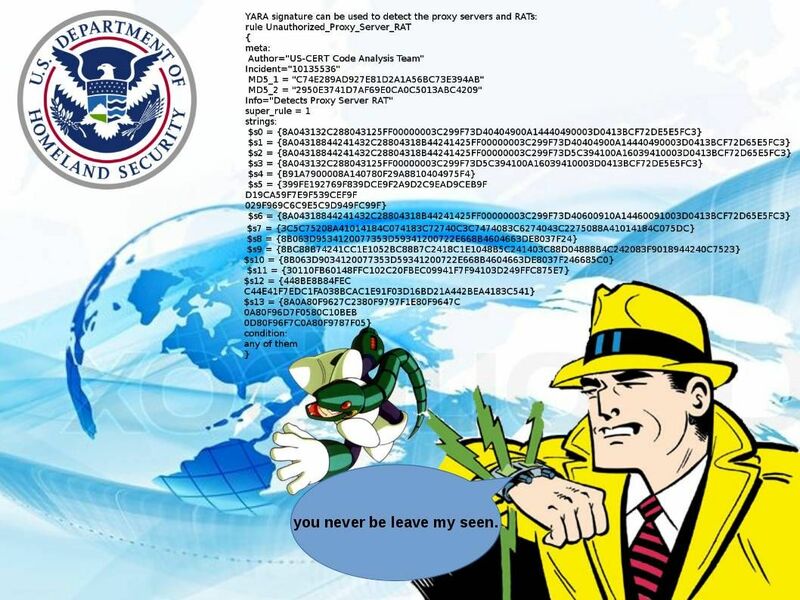 It looks that government enforcement unit not easy get the data in cloud farm easier. At least they must apply the key escrow or search warrant through official channel. Or you may say sometimes ask president approval can evade all the official channel. But how to monitor billion of mobile phones & computers? Perhaps it is not a secret, wikileak became a whistleblower since 2014 (see below url for reference). A strange issue draw my attention this year? There are more antivirus vendor detected finfisher malware this month (see attached detail in picture left hand corner).FinFisher customers include law enforcement and government agencies in the world. Do you think there is a new round of hostile country surveillance program being engaging at this year? Credit Card POS malware wreak havoc. Read the headline news notice that Forever 21 confirm that data breach occurred. The breach exposed card numbers, expiration dates and verification codes, but not cardholder names. Regarding to the information reported by engadget.com. Chipotle and GameStop suffered similar breaches this year (2017). Hotel giant HEI similar data breach occurred 2016. An announcement on 27th June 2017 told that Forever 21 Partners With Toshiba GCS on New POS. 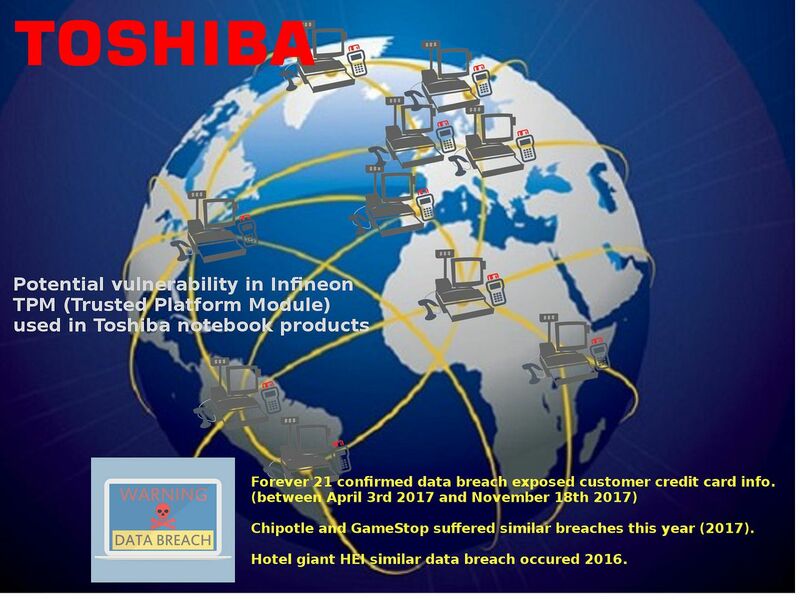 Found that hardware vendor announce that a potential vulnerability in Infineon TPN used in Toshiba notebook products. Do you think POS and notebook will be using similar TPM? Since POS and workstation can run on top of Windows OS. World not safe especially technology world! There are books of which the backs and covers are by far the best parts! Heard that the North Korean government suspected state sponsor of Lazarus Group cyber attack activities. A nick name to Lazarus group dubbed Hidden Cobra exposed to the world mid this year. The US homeland security claimed that they are the suspects of the cyber attack to Sony picture and behind the WannaCry (ransomware) cyber attack. By far we known US homeland security department with high priority to keep track their activities. It was strange and surprise to me that the total checksum provided by homeland security malware report only 1 item can find the record on virustotal database. It was not usual from technical stand point. The item 7 PE checksum can found on virustotal database. The earlier malware detected period fall back to 2014. Apart from that PE file checksum item from 1 to 5 only acknowledge by few antivirus vendor. As we know, Kapersky pay an important role of APT cyber attack investigation analysis so far. But this time it did shown on report. We understand that there is a lawsuit in between US government and Kapersky. May be this is the reason. However we couldn’t find any details on virustotal repository. It is very rare! It looks that F-secure virus vendor done well in this matter since their detection rate is 3 out of 7. On the other hand, the body guard for South Korea government (AhnLab) is the antivirus detect the attack earlier in 2014. However the overall detection performance only maintain on 2 out of 7. From general point of view, no matter Lazarus Group or Hidden Cobra their design goal looks is their natural enemy if the attack was engaged by North Korean government. However it looks that the major cyber attacks given by Hidden Cobra went to cross bother countries especially USA or European countries. The virus vendor F-Secure hometown in Finland. Their business market coverage in APAC country looks significant reduce in PC market recently. But they are aggressive in mobile phone devices. Perhaps the alert given by Homeland security malware attack target machines are on windows base. And therefore it such away bypass their focus. It looks confused with managed security services vendor especially APAC country of this cyber alert! The report given by US homeland security awaken our general opinion for antivirus vendor. Apart of my favor Kapersky there are potential antivirus contain powerful capability to detect and quarantine the unknown APT activities and malware. For example on the report we seen the brand name of K7, Cyren, VirusBlokAda, Emsisoft and BitDefender. 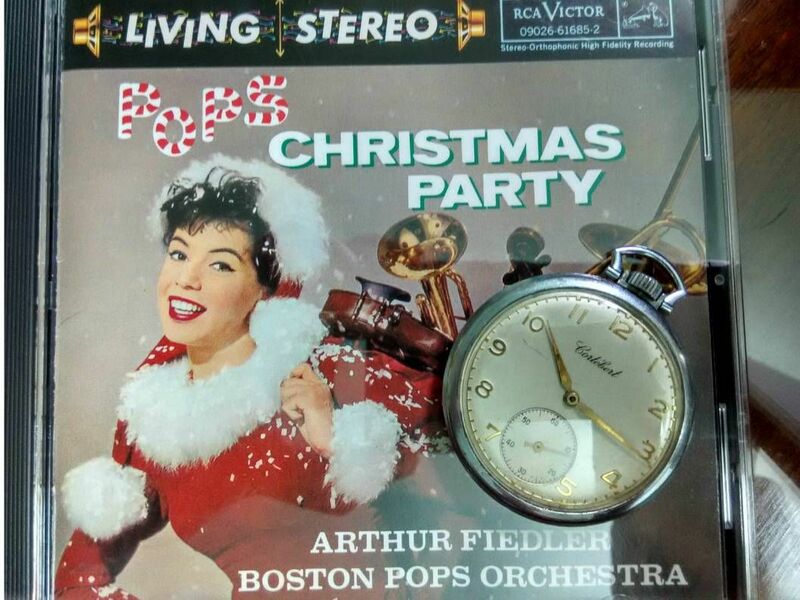 In the meantime, I wish you Merry X’mas and Happy New year. Stay tuned!